Modernize your home and office. U-Socket is an AC receptacle with built-in USB ports that can power / charge any device that is can be charged via USB, this of course including iPods, iPhones and iPads. 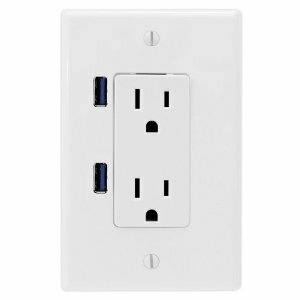 Enjoy the convenience of USB ports built right into the wall. In addition to keeping things neat and organized, U-Socket reduces your energy costs thanks to its 5-star energy efficient design that auto senses the required wattage and only outputs full power if something is connected to it. Designed and made in USA, U-Socket is 100% safe and listed to multiple UL, NEC and IEC (International Electrical Commission) standards.